Yesterday I had a rare and unexpected privilege. I was able to watch all three films of Peter Jackson‘s The Hobbit trilogy, back-to-back-to-back. I say rare because cinemas do not offer this kind of experience nearly enough, and unexpected because: they’re good, really good together. Certain films, even great ones like Christopher Nolan’s Dark Knight trilogy, gain very little from the trilogy viewing experience. They were created as separate entities and each tell their own story. In the case of Peter Jackson’s The Hobbit, however, the experience is much like The Lord of the Rings. All three films feel like they are parts to the same giant epic. The Unexpected Journey introduces audiences back to Middle Earth; The Desolation of Smaug escalates the conflict while building to the climax; and then there is The Battle of the Five Armies – what an ending it is. In a film that echoes the overall strengths and weaknesses of the trilogy it concludes, The Battle of the Five Armies is over-the-top spectacle fueled by the simple heart of the story it is telling. Those out there who lamented the limited presence of actor Martin Freeman in The Desolation of Smaug can breathe a sigh: he is much more involved in this film. Indeed, it can be argued that the best scenes of the movie come before the blockbuster titular battle sequence. One of the benefits of three movies allowed Jackson to develop individual personalities and presences for each of the dwarves in the company. This allows for more investment in the battle. By breaking the story into three portions, Peter Jackson is able to give each their own feel. The Battle of the Five Armies plays out like a tragedy, with all sides building to a war that few truly want. Each leader has their own personality but is depicted as small in the events that are rapidly spiraling out of control. Whether it is the gold-driven insanity of Richard Armitage‘s Thorin, the reluctant responsibility of Luke Evans‘ Bard, or the seeming indifference of Lee Pace‘s Thranduil: every leader talks of peace while preparing for war. 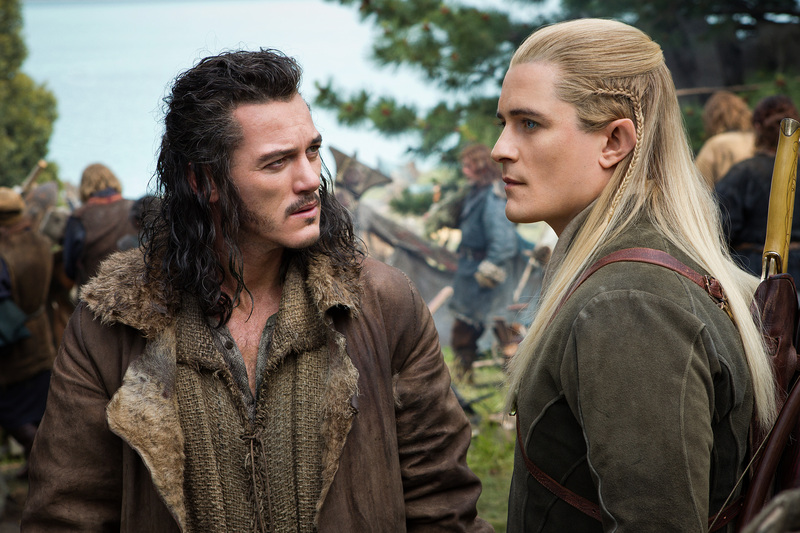 Bard and Legolas are two of the more reasonable voices leading to the battle. Here is where the not-so-subtle moral message of movie is hammered down. Greed is bad. Gold is not worth more than lives and the world would be a better place if more people treated jewels with as little value as hobbits do. With the wars in Afghanistan and Iraq still fresh in everyone’s minds, there are definite parallels to be drawn. A war fought solely over money while many innocents are caught and killed in the crossfire: not as fantastical as we’d all like it to be. Certain cynics have already dismissed Jackson’s newest trilogy as a Lord of the Rings cash-in, but after watching it all play out it is clear that this was not the case. The reality is a situation very similar to 2005’s King Kong. Peter Jackson has the spirit of a child, the love of a fan… and enough money to create Middle Earth in his own image. While The Hobbit trilogy does take its bombastic nature to a fault, there is a purity running underneath it, and a sincerity that is greatly appreciated. 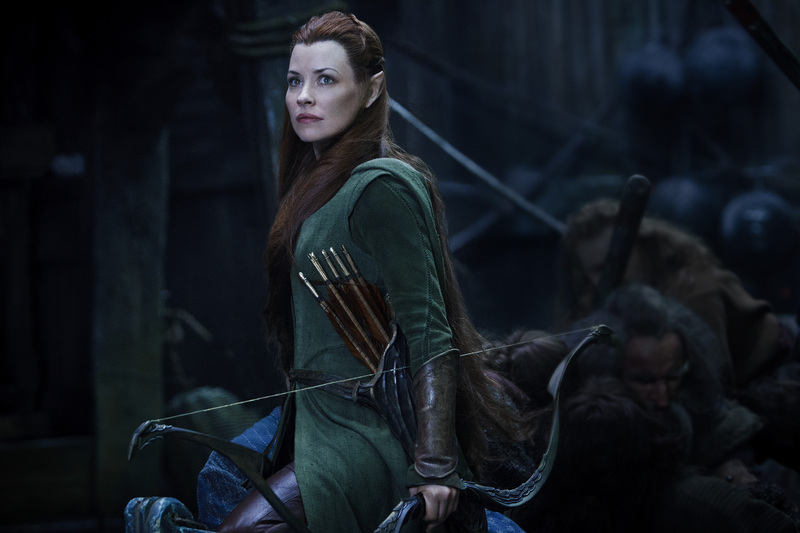 The controversial addition of Evangeline Lilly‘s Tauriel ultimately adds heart and even more of a sense of loss in The Battle of the Five Armies. Lightning may not have struck twice, but it was close. In the end, The Battle of the Five Armies serves as an immensely fun and satisfying conclusion to a trilogy done well enough to stand on its own. As the ending credits roll, one cannot help but feel a sense of sadness and gratitude at the sheer spectacle that is Peter Jackson and his Middle Earth epics. It is only a shame that the story is now truly done.